Now you can dream on a cloud with Drake. This pillow case shows a black and white image of drake at a concert with a microphone in his hand and there is a lot of smoke making it look like he is in the clouds. The Drake pillow case is 16 x 16 inches and has a zipper to make it close and with this case, you can make the perfect pillow for you couch, chair, and even the bed. 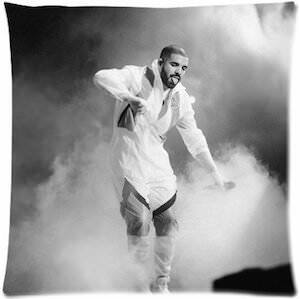 So if you love Drake then a pillow with him on it would be a great addition to your room.